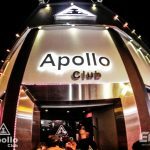 The best place to go clubbing in Crete? 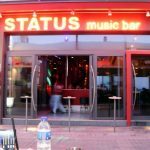 Well there are two main towns to go clubbing and partying when you visit Crete depending on your taste in music and nightlife. 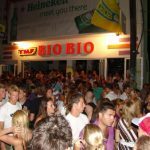 The first main resort is Malia, a huge 18-30’s resort with a bustling beach road and main strip filled with bar and clubs. 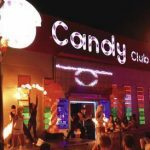 Malia is ideal if you you want to go clubbing in Crete and like RNB, Garage, house and dance music and can handle partying to dawn every night. 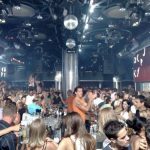 The second town in Crete for clubbing is Hersonissos, this resort attracts more party goers from Europe, Ireland and of course the UK. The clubbing scene is smaller than Malia but no less hectic and mad. 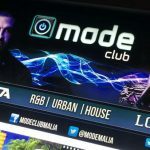 Music here is mainly trace, house and dance based with many guest DJ’s appearing through the season. Malia just an hour away from Heraklion on the east coast of Crete. The music ranges from RnB to funky house, old school dance music and of course cheesy disco music. Some bars we can personally recommend have to be Candy Clu, Apollo, Warehouse, Zig Zags, Chubby whites and more. Drink offers range from 2 for 1 on most drinks, this is every night, plus free shots. Closing times are about 4 in the morning with some open till 6 am and some 24 hours. If you cant get away from the drink then Petrino’s 24 hour bar is a must. For the sun worshippers there are plenty of beach bars, from Dolphin, Bikini, Pleasure and Mikes beach, all playing great music and cheap sun beds. You can get weekly passes for the sunbeds and get discounts on water sports for using a certain beach. 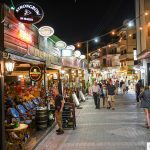 Also some of the beaches in Malia are related to the clubs and pubs on the main beach road, so check out the beach scene and see what discount passes you can pick up for cheap drinks at night. 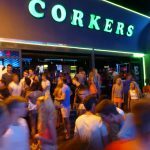 Remember to make sure you always go out in pairs or groups and do go wandering alone to make sure you have a safe holiday clubbing in Crete. 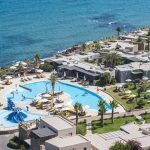 A varied and colourful resort, Hersonissos is where all the people who like dance music, trance and house music come to go clubbing in Crete. 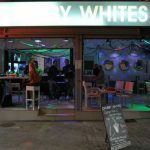 This resort is very popular with the Dutch, Irish and Italians and you will find many Dutch bars alongside Irish and English themed bars. Clubs here are bigger than that of Malia and the atmosphere is still as friendly, drink prices are a little more expensive than that of Malia but some say the quality is better, especially the cocktails. The biggest clubs are on the main road and a few situated on the actual beachfront of Hersonissos itself. For Hersonissos drink prices add an extra euro or two to the price list, but in most places you still get BOGOF deals. Its free entry into all of the clubs also, which applies to Malia also. Another good thing is you don’t have to stand outside and smoke as in Crete you can smoke anywhere in pubs and clubs, the Greeks don’t mind at all.